- Shuttle transport is available (upon request) from the railway stations in Morteau or at Le Locle (CH). At the traffic circle in Villers-le-lac take the route toward Neuchatel. 200 m. before the border, turn right toward Le Chauffaud. 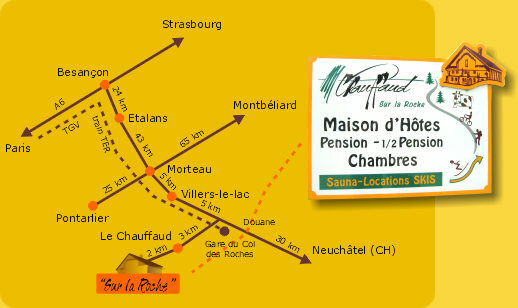 The Inn "Sur La Roche" is situated 2 kms past the village of Le Chauffaud (there will be a sign on your right).